By Michael Lardelli - posted Tuesday, 15 May 2012 Sign Up for free e-mail updates! The leader of the world's foremost Peak Oil research group is Kjell Aleklett, Professor of Physics at the University of Uppsala in Sweden. He has just published a book on Peak Oil that summarises a decade of scientific research. Kjell's book is truly remarkable but not only as an unparalleled analysis of the reality and implications of Peak Oil. The book is also a unique example of how art can be used to assist the understanding of science. For these reasons I believe Kjell's book will soon be recognised both as the definitive work on Peak Oil and also as a unique scientific text. I simply do not see how it can be surpassed – unless there is another person who is willing to devote a decade of their life to building up a research enterprise that has now published over 30 peer-reviewed scientific papers on Peak Oil and related issues. Of course, there is no other person than Kjell. Somehow my name has wound up on the cover of Kjell's book and that deserves an explanation. When Kjell lectures to his university students or at oil and energy conferences or is interviewed by the media he speaks English. If you search for his name on YouTube you will find numerous examples. So why would Kjell need a "translator". It's a longish story…. On 18 May 2007 the world's leading "clearing house" website for peak oil and related news – Energy Bulletin - published an article by Kjell titled, "Global warming exaggerated, insufficient oil, natural gas and coal". I was absolutely fascinated by the idea that the world's accessible fossil fuel resources might be insufficient to allow for the dramatic global warming scenarios that many sincere and rigorous climate change researchers were warning us could happen. I wanted to see this information more widely understood in Australia and the Australian-based website, Online Opinion, seemed a suitable place to start. (it is frequented by a number of politicians, political advisors and journalists.) However, the quality of the English in the article was less than ideal and I did not want that to act as an excuse for sceptical readers to dismiss its content. The Energy Bulletin article was actually a translation by Kjell of a more detailed article published in Sweden's leading broadsheet newspaper, Dagens Nyheter. As far back as the second half of 2007 Kjell was thinking about writing a book so he next tested my abilities with translation of a possible chapter. At that I time I don't believe he was contemplating a reworking of his scientific papers to make them accessible to a wider, non-scientist public. He was thinking more of descriptions of his experiences travelling the world to spread awareness of Peak Oil to politicians, corporate leaders and the like. That book never eventuated (although much of what it might have been can now be found in Peeking at Peak Oil). Instead, Kjell's energies were diverted into writing a blog – Aleklett's Energy Mix – and shortly after he began he asked if I wished to translate it. Once again a better quality of English makes the contents of Kjell's blog less easily dismissed by sceptics. I have now been translating Kjell's blog for almost 5 years. This is done at night, after work when my young children are finally asleep and there is time to think. The reward I receive for this is the work itself – second languages are definitely "use it or lose it" affairs. Having put a lot of work into learning Swedish I would rather not lose it even though I now live on the other side of the world from Sweden. Translating Kjell's blog also gives me insight into events at the very frontline of the struggle between the scientists who warn of peak oil and the government and corporate elites who most definitely do not want to talk about it. (If a politician admits that Peak Oil is an issue then they will be expected to do something about it – but there are no easy or popular "solutions".) Nevertheless, I sometimes wonder how many words I have written by now and how many books Kjell's collected English blogs might fill. Scientific research takes time. It can take years to find funding, then recruit students and then to do the research work before one can publish. When I began translating for Kjell in 2007 he had published only two peer-reviewed articles in scientific journals on Peak Oil issues. However, by late 2010 (when work on Peeking at Peak Oil began) this had surged to 19 articles and the total currently stands at 31 with several more "accepted" but not yet in print. In mid-2010 Kjell told me he was thinking of a new book project that would summarise the published work of his research group. He told me he had recruited his friend of many years Olle Qvennerstedt to provide illustrations for the book and that he had in mind something rather special – a book that would be a true fusion of science and art. He would come to Australia for three months in late 2010 to tour and to begin working on the book. 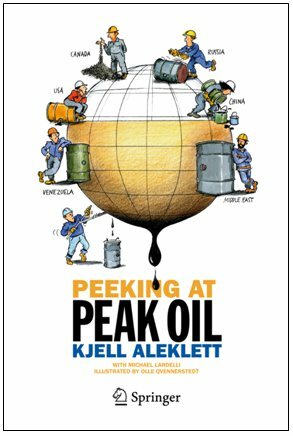 While somewhat nervous at the amount of work involved I agreed to the task and Kjell and Olle spent November at "Camp Peak Oil Adelaide" putting together the first chapters of Peeking a Peak Oil. Originally it was planned to complete the work by March 2011 but that was certainly a much too optimistic future production scenario! Peeking at Peak Oil production would take at least a year longer. Throughout 2011 Kjell sent me chapters to translate but he did not work on them in the order you will find them in the book. It was only when the publisher's typesetter sent us "proofs" of the book to check for errors in April this year that I read all the chapters in their final order for the first time. I was struck by two things. First, the book had an internal coherence I had not appreciated previously. Second, the book is over 350 pages long and I was surprised at how much I had translated over the previous 18 months! The task had not seemed so overwhelming when broken down into small parts. Translation is not a word-for-word affair. If it was then any computer could do it. So when Kjell wrote his draft chapters in Swedish he gave me a fair amount of leeway in translating them into English. Sometimes I reorganised the flow of ideas a little if I thought it added to clarity. But Kjell always had the final say and it is completely his book. The reason I am not cited as the translator on the front cover of Peeking at Peak Oil is the publisher, Springer. Since there was no pre-existing Swedish book from which Peeking at Peak Oil was translated the publisher thought that "translated by" was inappropriate. But when you pick up this book do not think for one moment that "Kjell Aleklett with Michael Lardelli" means I have made any theoretical contribution to it. It is Kjell's (and Olle's) baby. Incidentally, there is now a Swedish version of the book and I am pleased to say it is a translation from my English text. A Spanish translation is also being prepared. When Kjell and Olle packed up Camp Peak Oil Adelaide and prepared to return to Sweden they held a party. Since it was a very Swedish party speeches were in order. I had two things to say. To Kjell it was how I thought (and still think) that his research is immensely important for our future and it is a privilege to be able to help him get the message out. To Olle I expressed my admiration for his artwork and how it adds so much to the book. The one word that best describes Olles illustrations is "friendly". Peak Oil can be a very confronting topic for many people but Olle's drawings are a little like the words "Don't Panic" on the cover of The Hitchhiker's Guide to the Galaxy. They are reassuring and make Peeking at Peak Oil so much more attractive to read. Peak Oil will affect every one of us and so everyone must find their own way to contribute to a "solution". Doing what I can to help Kjell's message be heard is my small part in this effort. Peeking at Peak Oil shows us the limits of our future reality – what can happen and what will not. It is then up to each and every one of us to do something about it in whatever way we can. "There are 1,001 solutions already but you have to think about it. You have to study it and see what solutions you can come up, and there is no panacea you know. …. There is small little things in my opinion you can do and when you add these all up, it amounts to quite a lot, but you have also to get ready to live with less oil."